You read it right "Long Island Buffalo" - yes, there is a buffalo farm on the north fork and a restaurant named Tweeds that's dedicated to the All American Bison! 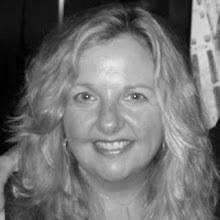 Since it may be a little while until I can visit Tweeds Restaurant and Buffalo Bar, located in Riverhead between the south and north forks of eastern Long Island, I thought I'd write about my husband's lunch instead (yes, it's dead of winter in NY, local foods are scarce and I'm hard pressed to cook an interesting meal with local food -- 7 weeks til spring). 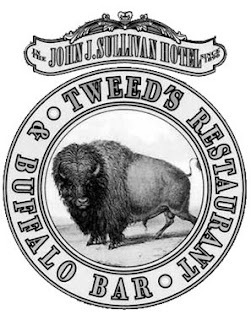 Tweeds (which is named after Boss Tweed of Tammany Hall politics fame) is a "charming" (Henry's words) Victorian style restaurant in a circa 1890's hotel called JJ Sullivan's (who supposedly was the first card carrying Tammany Hall politician). The restaurant, which opened in 2000 and is owned by Ed Tuccio, has the original tin ceiling, Victorian lighting and a magnificent 1890s mahogany bar. Tweeds serves buffalo meat from local buffalo (and from out of state as well). An upscale venue, Tweeds' focuses on serving "local products whenever possible" not only because it tastes better but to "support the local economy" (sounds like a locavore to me). In fact, Mr. Tuccio, who Henry chatted with for quite a while, has a buffalo/bison ranch just a few miles away on the north fork with 300 head of bison on 500-acres. They talked about the challenges of processing meat in New York because there are no abbatoirs nearby so Ed has truck the bison to Pennsylvania!!! Talk about food industry POLITICS! Open for lunch and dinner, this time of year the menu features Long Island clam chowder and local artisanal cheeses, Long Island wines and buffalo cappaccio, several cuts of buffalo steak, buffalo burgers, corned buffalo (this is beginning to sound like the shrimp options at Bubba Gump Shrimp Co) and their famous BUFFALO CHILI, which is what Henry had (and loved). Not in the mood for buffalo, Tweeds also serves several kinds of fish and shellfish, Aquebogue (north fork) duck, omelets made from Baiting Hollow Farm eggs and organic beef! I look forward to heading over there in the warmer months so I can have a juicy buffalo t-bone with a side of sweet Long Island corn, local tomatoes and some of those yummy Long Island cheeses and a glass of Long Island wine. Buffalo meat is a healthful choice and should be included in a carnavore/locavore diet as a substitute for beef. With a texture and taste similar to beef (although sweeter and more flavorful), buffalo unlike beef is low if fat, cholesteral and calories. In fact, with only 2.4 grams of fat per 3 1/2 ounce serving buffalo has 1/3 the fat of skinless white meat chicken! Grass-fed buffalo is high in omega 3 fatty acids which have cardiovascular and brain benefits and unlike cattle buffalos rarely need antiobiotics. The ultimate in red meat "spa cuisine", chefs prefer to serve buffalo rare or medium rare otherwise the meat dries out and loses its flavor.